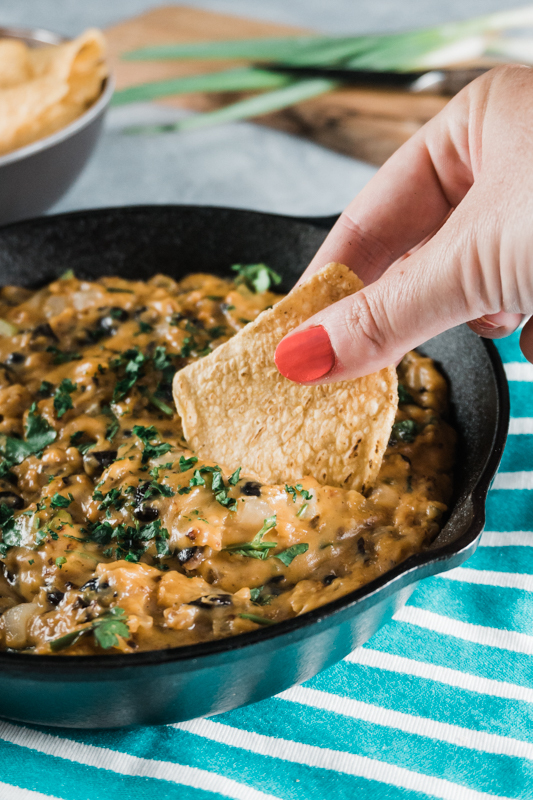 This Vegetarian Chili Cheese Dip is packed with fresh veggies, spicy jalapenos, and hearty black beans. 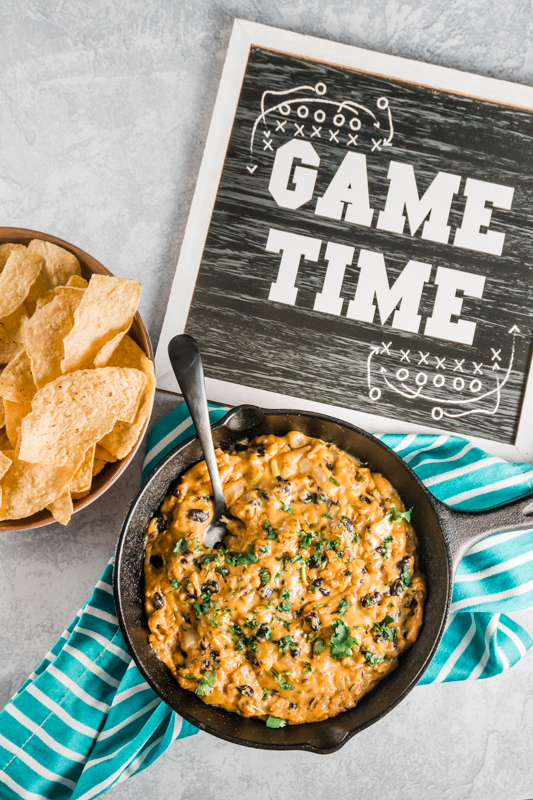 It takes just 20 minutes to prepare, and is sure to be a hit at your next fall football party. Plus, it’s 100% vegetarian and gluten-free. It’s that time of year again – football season! It’s definitely my favorite sports season. But let’s be honest. I’m not really in it for the games. I’m in it for the tailgating. 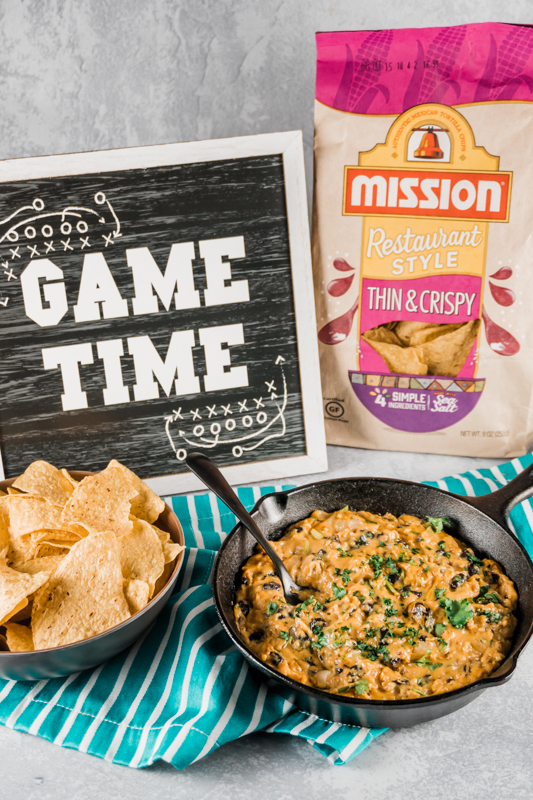 And that’s why I was so excited to create this new Vegetarian Chili Cheese Dip recipe for Mission® Thin & Crispy Tortilla Chips. We just love hosting our friends for football games. Especially since we moved back to Florida this year. 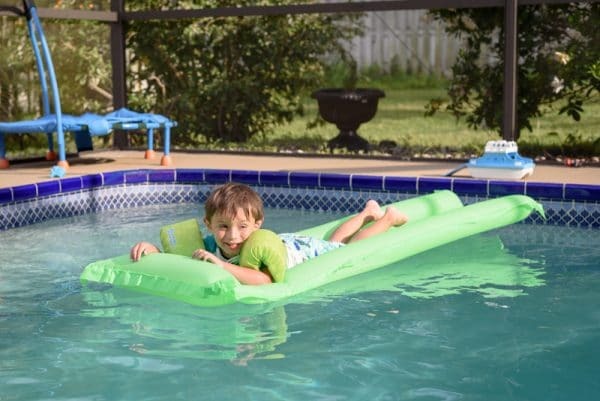 Now football season involves a lot less jackets and scarves – and a lot more bathing suits and pool time. What to serve at a tailgate party? I love experimenting with new recipes on my friends. And throwing a party is one of my favorite excuses to try out a new dish. But one thing that’s always consistent is that finger foods are essential! At our parties, everyone tends to be up and about. Talking with friends, cheering for their team, and making the rounds to the buffet table. So, chips and dip are the ultimate party food. 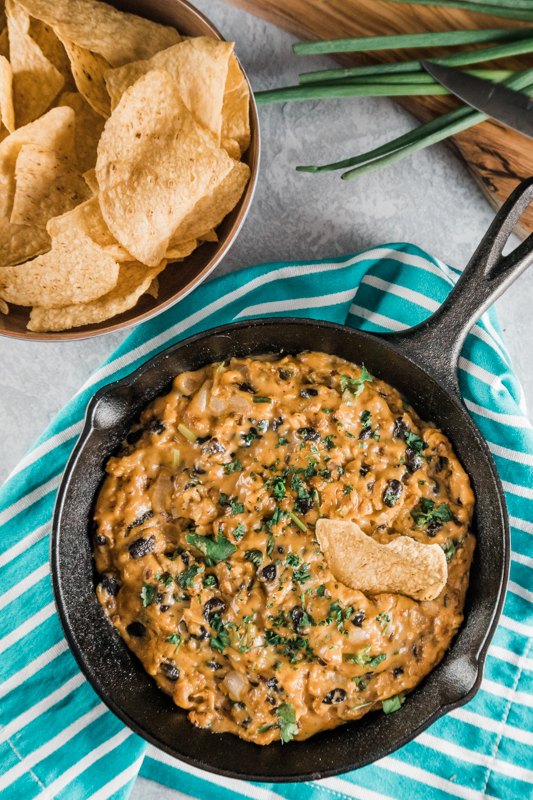 For this weekend’s tailgate, I came up with this amazing new Vegetarian Chili Cheese Dip. I think it might be my new favorite dip recipe. If you’re going to serve a dip as your main course, you better make sure to have some amazing chips to go along with it! 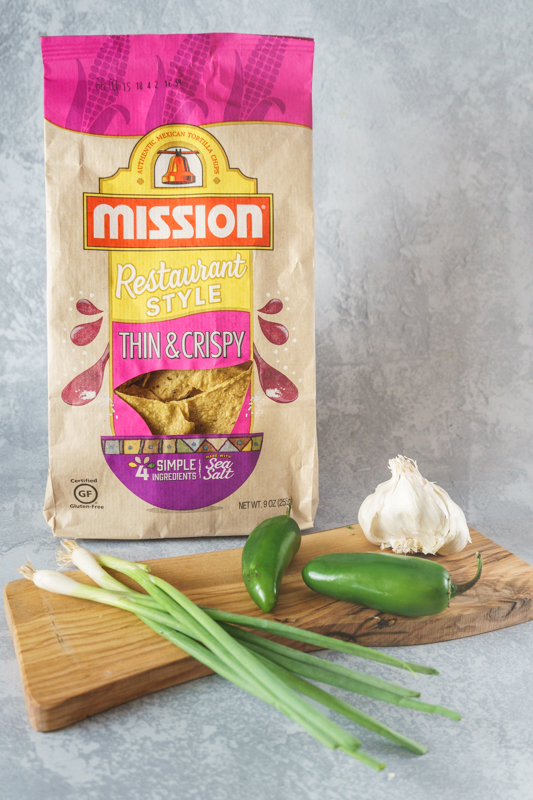 I’ve been a fan of Mission Thin & Crispy Tortilla Chips for a long time. I think I’ve tried every variety they offer, and they’ve never let me down! 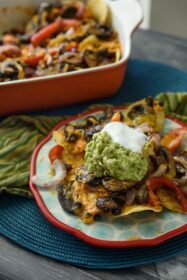 I paired this Vegetarian Chili Cheese Dip with the Mission Thin & Crispy Tortilla Chips. I love how these chips are so perfectly crispy, just like restaurant-style tortilla chips. All of the Mission Chips are made with just four simple ingredients, including sea salt. That’s probably why they’re so fresh and tasty on their own. My family often snacks on them straight out of the bag! Plus, they’re made without any artificial flavors or colors, and are 100% gluten-free. So, I can feel good about serving them to my family. 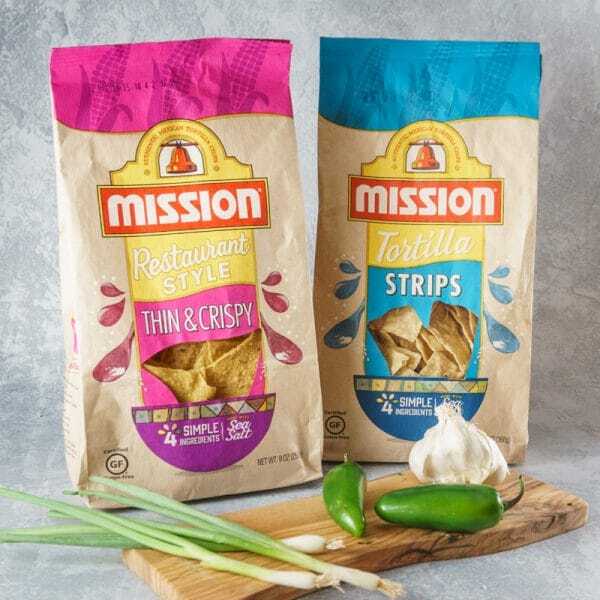 Make sure you check out all the other varieties of Mission Chips as well. 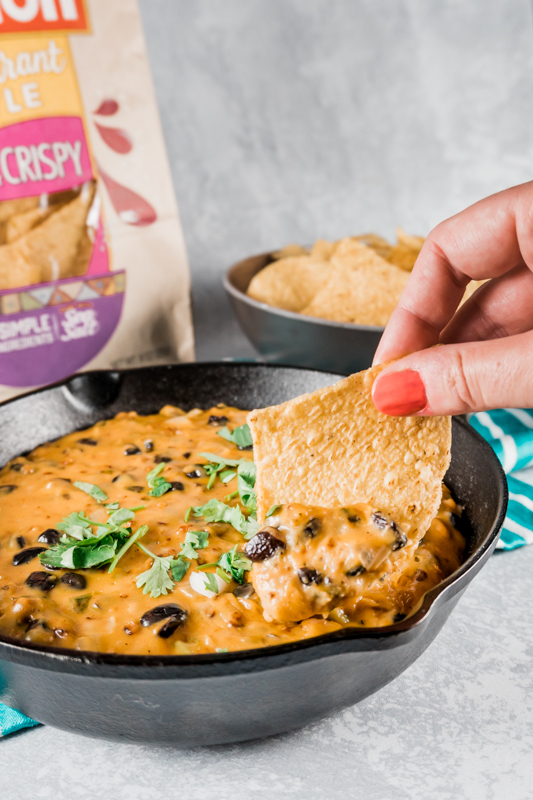 The Mission Strips Tortilla Chips are another one of my favorites – they are just the perfect shape for dipping! They would pair perfectly with this Goat Cheese Dip with Balsamic Roasted Tomatoes. And Mission Rounds Tortilla Chips are just perfect for nachos. In fact, it’s what I use for my famous Loaded Vegan Nachos. 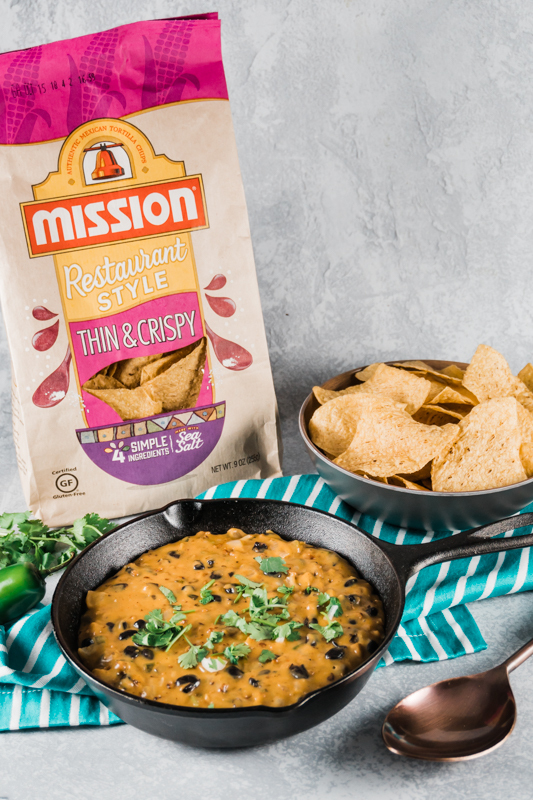 Check out the Mission Chips website for more recipe ideas and make sure to use their store locator to find the products near you. I don’t know about your kids- but mine really does not have the attention span for a full football game. But give him a coloring book, and he’s set for at least 20 minutes. 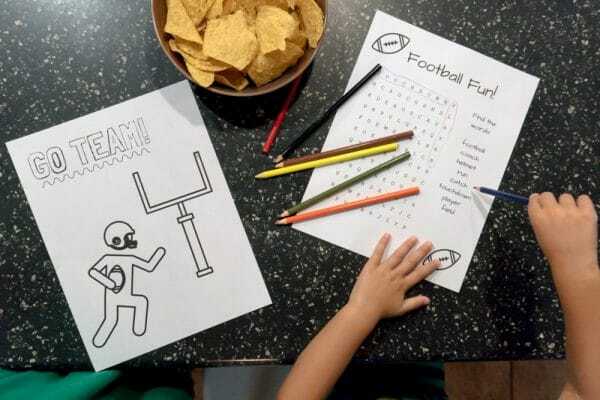 So I came up with these fun, football-themed activity sheets for our tailgate parties. Don’t judge my artistic skills – it was good enough for my three-year-old! I made a small (and easy) crossword puzzle and a fun little coloring sheet. I thought you all might like these as well, so you can download the printable activity sheets here. I hope they buy you enough time to at least eat your dinner at the next party. 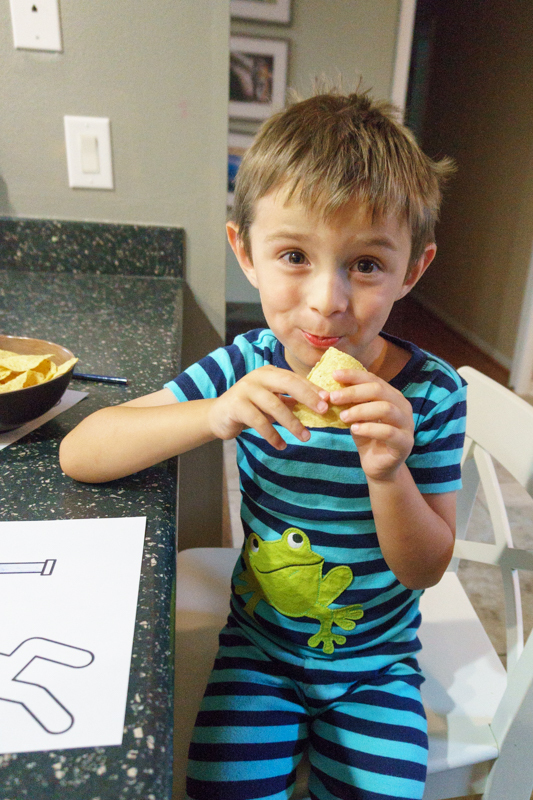 By the way, my son thought the chips were amazing right out of the bag, even without my dip! And yes, he’s wearing frog pajamas to a tailgate party. Because he’s three, and that’s how he rolls. Are you ready for the dip yet? 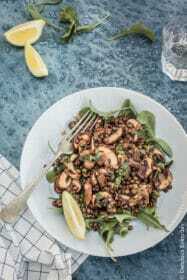 You won’t believe how simple and fun this recipe is to make. And it only takes about 20 minutes to pull together! 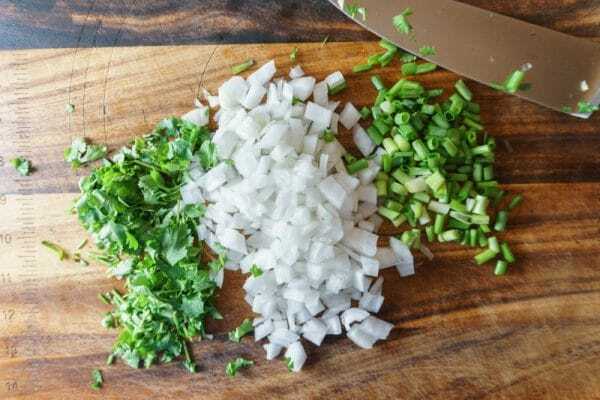 Start off by chopping up all the veggies and herbs – I used a combination of sweet onions, jalapeno peppers, scallions, and fresh cilantro. Be careful with the jalapenos. They’re spicy! It’s always best to chop them on a separate cutting board if you can. And try not to touch the seeds as you de-seed them. Next, simply sauté the onions and jalapenos in a bit of olive oil, until they start to soften. 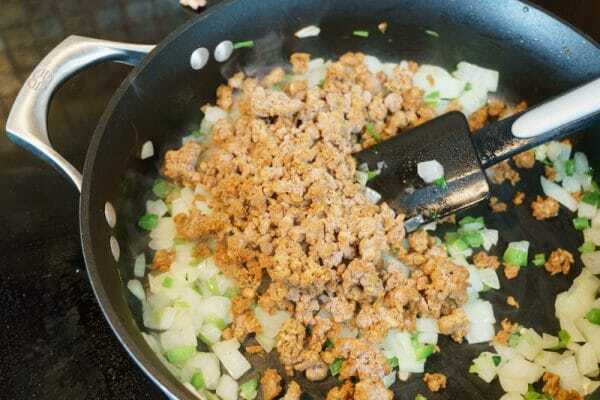 Then, add some meatless “beef” crumbles. 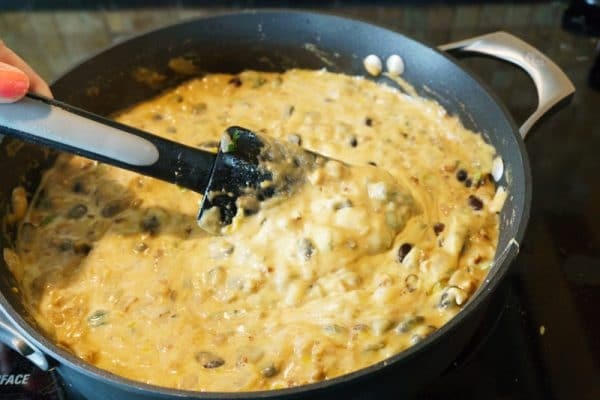 Chili cheese dip usually features ground beef, but we are substituting soy crumbles for our vegetarian version. You should be able to find them at just about any grocery store these days, usually in the frozen section. But if you have trouble, you can leave them out and this dip will still be amazing. 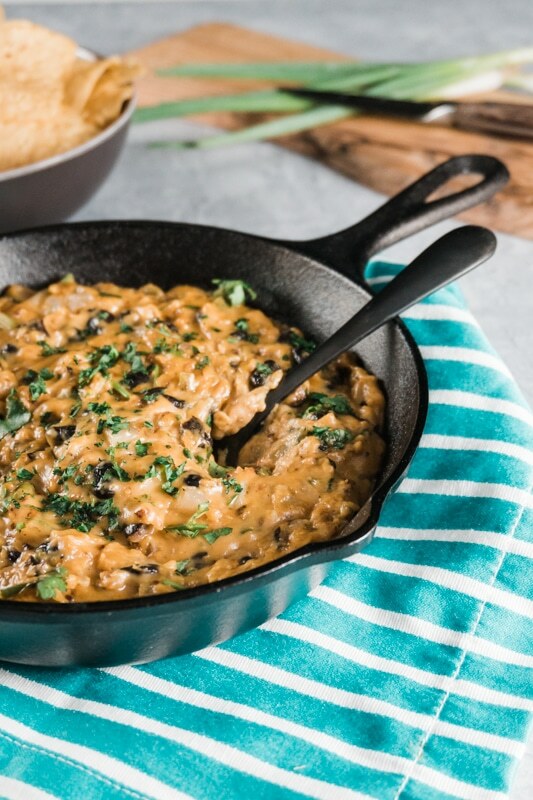 The black beans are hearty enough on their own! 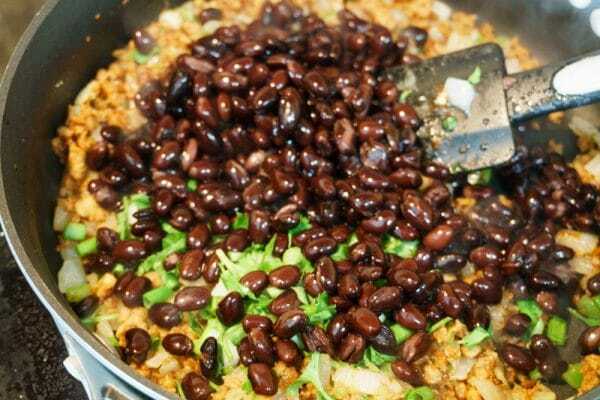 Next, mix in black beans, scallions, cilantro, and taco seasoning. Let everything cook for a few minutes. Meanwhile, you can prep the cheese. 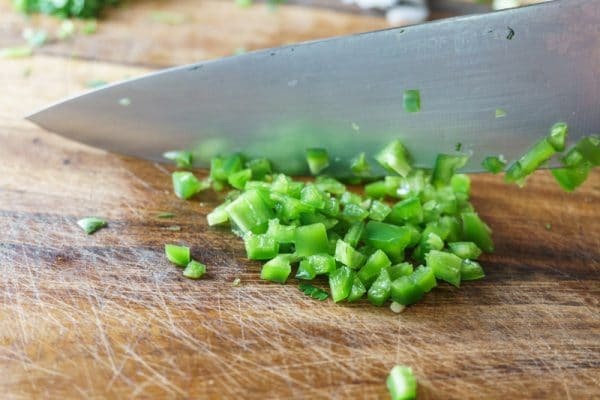 This is literally the most important part of the vegetarian chili cheese dip. I used a combination of cheddar cheese and Monterey Jack Cheese. 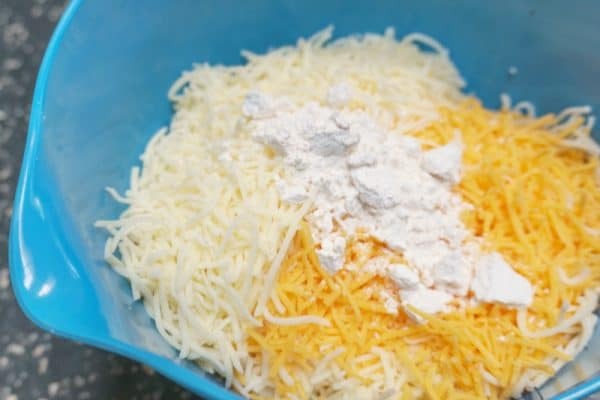 The secret to perfect chili cheese dip is mixing in a bit of flour with the cheese. It helps your cheese dip stick together better, so it’s the perfect consistency. This is also a great trick to use when making fondue! 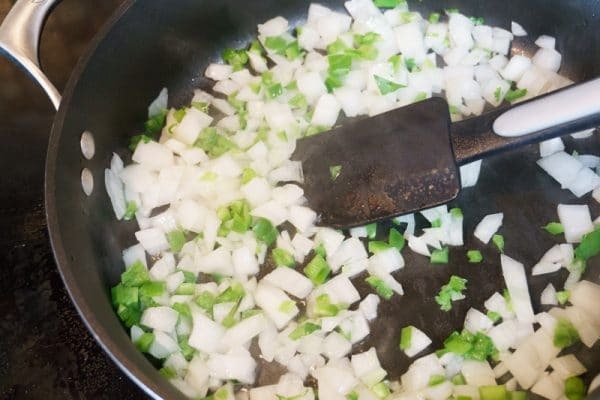 When your veggies are cooked, add two cups of whole milk to the pan. Let it come up to a light boil. And then start to mix your cheese into the pan with the veggies – adding a little bit at a time so it melts evenly. When all the cheese is melted and smooth, add a bit of salt and pepper. 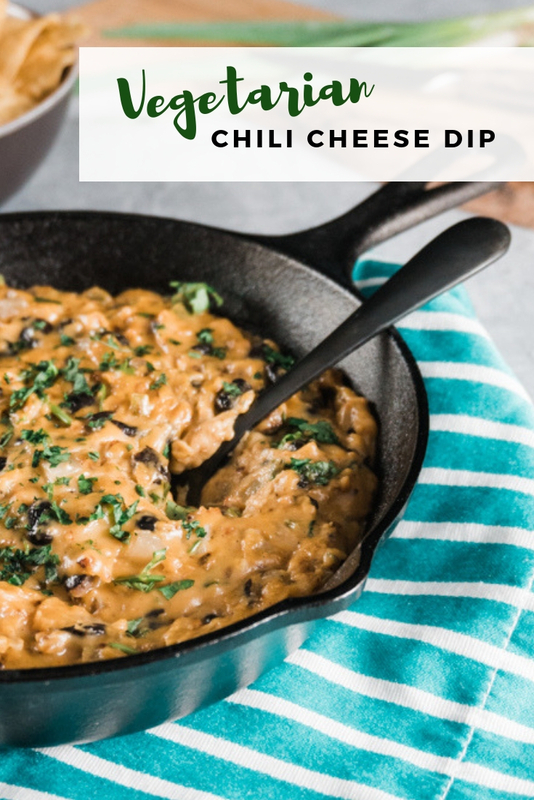 And there you have it – a perfect Vegetarian Chili Cheese Dip! 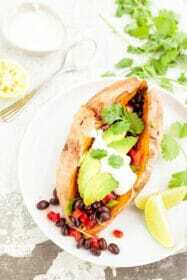 Sprinkle the dip with the remaining cilantro, and serve with Mission Tortilla Chips for dipping. Enjoy! When oil is hot, add the onions and jalapeno peppers, and cook for 4-5 minutes until softened. 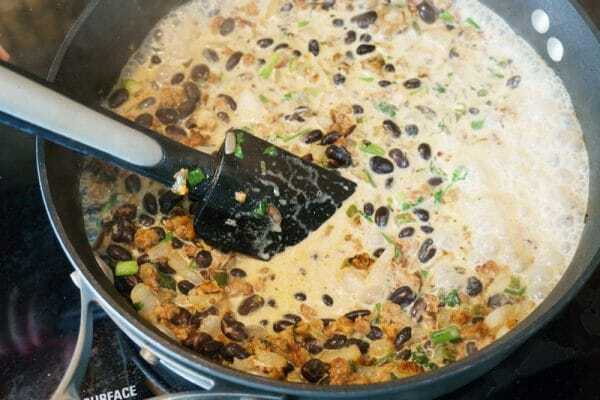 Add black beans, scallions and half of the cilantro. Stir and cook for 1-2 minutes. Add milk to the pan, and allow to heat until just beginning to boil. Slowly add the cheese, one small handful at a time, stirring until melted. When all the cheese is melted and smooth, add salt and pepper to taste. 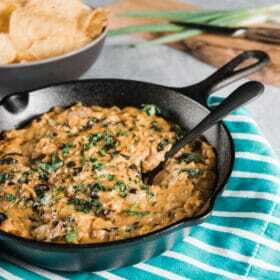 Remove from heat, and top the vegetarian chili cheese dip with the remaining cilantro. Tip: This dip is best when eaten warm, right after cooking. Melted cheese does not save well! If you have to reheat it, I suggest adding a bit of extra milk or water first. Then heat in the microwave, stirring every 30 seconds, until warmed.